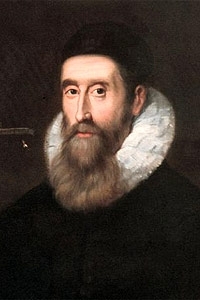 John Napier was a Scottish mathematician who found lasting fame as the inventor of logarithms. He also invented at least one war weapon. His position as a member of the Scottish nobility allowed him to more spend time on scientific research than would likely have been possible for a man of a humbler background. Napier also devised a specialized form of abacus for multiplication and division, which bears the name “Napier’s Bones” to this day. The son of 16-year-old Archibald Napier, John was born in Merchiston Tower, Edinburgh in a building which now forms a part of Edinburgh Napier University, which is named in his honor. His family formed a prominent and influential part of the country’s nobility and was very wealthy. Following the pattern common at that time for members of the nobility, he did not begin formal study until the age of 13, when he attended St. Andrews University for a brief period. His uncle, who was Bishop of Orkney, advised him to continue his studies abroad, and in 1564 John sailed for the European continent. Once overseas, Napier was disappointed to discover that there were few teachers of Greek available. Since he had become passionately interested in the study of religious texts, the language was vital for his continued educational development. Some historians believe that he may have traveled to Switzerland to be taught, since there were small numbers of scholars specializing in Greek in both Geneva and Basel. In any case, he was fluent in Greek and Latin by the time he returned home in 1571. Nevertheless, it was in the field of mathematics to which he was attracted. Back in Scotland, Napier married his first wife, Elizabeth, and settled at a Stirlingshire estate. He remained utterly fascinated by mathematical study, so much so that his hermit-like lifestyle led some of the local inhabitants to take him for a wizard. Meanwhile, Napier was making a further name for himself both in Scotland and abroad with his fiery denunciation of the Roman Catholic Church, to which he was vehemently opposed. In 1579, Elizabeth died and he married Agnes, to whom he remained devoted. Contemporary mathematicians were impressed with Napier’s work, recognizing its potential to hugely reduce the time taken for many arithmetical operations. Although he did not invent it, Napier also popularized the use of the decimal point. Outside mathematics, Napier was worried by the threat posed to England – and by extension, Scotland – by the Spanish Armada. Just before it sailed in 1588, he came up with the idea of using a mirror to focus the rays of the sun on the wooden ships of the time, thereby setting them ablaze. He spent the last few years of his life living quietly at his birthplace, dying as a result of chronic gout in 1617. He is buried in his native Edinburgh, in St. Cuthbert’s Church.